This study created an innovative analytical method for the life sciences, which can comprehensibly detect molecules from a live single cell or organelle in minutes. 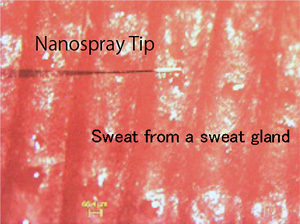 It does so by extracting the components of a cell or organelle with a metal-coated glass microcapillary (i.e., nanospray tip) and subjecting it to nanospray ionization and mass spectrometry. Dr.Masujima has disclosed this method to Japanese pharmaceutical companies and collaborated with them to establish the "single cell drug discovery" method. This method makes it possible to evaluate the pharmacology, localization, metabolism, and toxicity of candidate molecules for new drugs in only ten minutes with a single cell. Now, this process is drawing the attention of many companies engaged in this field all over the world. Several examples exist that demonstrate the power of this technique. For instance, the molecular aspects of circulating tumor cells (CTCs) have been detected in blood. This example represents a painless, convenient, and rapid method for molecular diagnoses from a trace amount of blood, and has far-reaching implications in the medical field. Moreover, this technique is beginning to play an important role in the field of plant sciences, with new applications emerging from basic plant research to new agricultures (e.g., plant-factory). He spent over a quarter of his research career for his desired single cell analysis and this is one milestone which is original and innovative in the world, including the related basic patenting, its revolutionary contribution to drug discovery, and its contribution to both life and medical sciences. Owing to the aforementioned reasons, Dr.Masujima was selected as the awardee of the 14th Yamazaki-Teiichi Prize in measurement science & technology. When Dr.Masujima began observing cells under a video microscope, he came to believe that the molecular mechanism of life would be elucidated more directly and clearly if he could identify cell constituents immediately and comprehensively through mass spectrometry. Although single-cell analysis is becoming more popular globally, at that time, the laser irradiation used for MALDI-TOF⁄MS for which Mr. Koichi Tanaka received a Nobel Prize in Chemistry, could detect only easily ionized molecules such as lipids. Indeed, the methods available at that time were poor for the comprehensive analysis of molecules within a cell-both in sensitivity and molecular identification. Thus, he considered it necessary to develop a novel method to address this issue. In 1999, Dr.Masujima was invited to a millennium symposium where he proposed a revolutionary method named "video mass spectroscope", which combined video microscopy and mass spectrometry. This method can observe a single cell under a microscope, and when the cell displays interesting behavior, a microcapillary can be directly inserted into the cell to capture the components by suction. However, initial trials indicated that typical mass spectrometry was unable to detect any cell components . After seven years of challenges in vain, he could finally observe mass peaks for components from a single cell. He did so by sticking a gold-coated microcapillary (i.e., nanospray, Figure 1) into a cell and extracting its components (Figure 2). After extraction, an ionized solvent was infused from the rear end of a tip into the components of an ultra-trace single captured cell of 1 piloliter or less at the end. 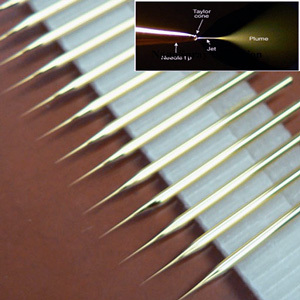 This sample was introduced into the mass spectrometer by a nanospray that was generated by only applying an electric field between the mass spectrometer and the tip. That signal continued for several minutes, which allowed him to measure the entire spectrum (i.e., comprehensive molecular detection), as well as MS⁄MS for the components of the cell (i.e., structural analysis and molecular identification), in which a molecular peak is selected and the molecule is fragmented. He was the first to succeed in extracting differences in state and localization between molecular peaks as well from the difference in spectra. "This method is capable of comprehensively detecting not only cytoplasmic components but also 2000 or more internal molecule groups in a single small organelle in five minutes. This can be done while observing live cells and avoiding cell membrane lipids by sticking a tip directly into the cell of interest. It has made it possible to detect the components in a single cell at high speed and with an extremely high level of sensitivity. Furthermore, in differential analysis, specific molecules can be extracted from different states or between different areas of the cell. This method is capable of not only elucidating the mechanism of life-giving molecules, but also for an extremely wide range of applications." (Figure 3). This technique is the world's first method capable of evaluating the pharmacological properties, localization, metabolism, and toxicity of candidates for new drugs in approximately five minutes with a single human primary-cultured cell. It was called "Single Cell Drug Discovery" and he was honored to present a lecture at the conference of the American Society for Mass Spectrometry, which took place in June 2014. This conference included mass spectrometry specialists of pharmaceutical companies from all over the world, and he reported my longtime joint research achievements with four Japanese pharmaceutical companies. His presentation got interest of three world-leading pharmaceutical companies. In October of the same year, he presented the lecture again to GSK's research laboratories all over the world via the Internet congress system. SANOFI, a leading French company, asked him to perform many preliminary tests. Today, there is a movement against animal tests, and the Single Cell Drug Discovery method is about to venture into the world as an important new drug discovery technology. Painless, multifaceted molecular clinical diagnoses and health monitoring with a single drop of body fluid would be ideal in the medical community. This method's capability of detecting ultra-trace molecules promptly and comprehensively is a significant advantage to the medical field, in which molecular diagnoses are increasingly being conducted via mass spectrometry. Figure 5 shows the molecules detected from a drop of sweat from a sweat gland in a person's finger. Since its volume is about 1 nL which is 1000 times volume of a usual single cell , the detection is much easier. From the detected molecular groups, the person's dietary habit, constitution, health condition, as well as ingested constituents, such as alcohol, smoke, drugs, and caffeine could be identified. In collaboration with a leading information company, he is conducting empirical research to collect and analyze data and set indices for a future medical research project. Moreover, in collaboration with the National Cancer Center, he succeeded in detecting molecules of CTCs, which constitute the principal cause of cancer metastases. Indeed, single cell mass spectrometry is opening up a new approach to future medical diagnoses. 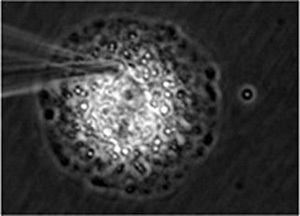 Plant cells are large, have vacuoles, and are easiest target to handle in single cell mass spectrometry (Figure 6). They applied this method to analyze the correlation between the light wavelength of LEDs and the variation of molecules produced inside plantsfor future plant factory. 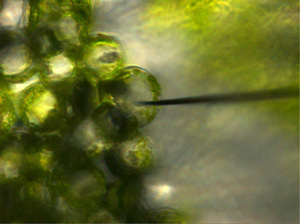 Moreover, this technique is being used to verify the flavonoid glycoside inside the petal cell vacuole or to directly detect and analyze catechins inside tealeaf cells by companies. This method is thus applicable to the creation and verification of useful crops species and can be widely used for the analysis of plant diseases. The comprehensive and quick detection of molecules of live cells, will open a new era of basic life science, as is easily imagined from the fact that many joint research projects are underway using this technology. From a single cell to tissues, single cell mass spectrometry will become indispensable for its structural formation mechanism, including molecular interaction among multiple cells. For many challenges which is not yet achieved in the world, this method will allow us to step into it and open new fields and knowledge by expanding its potentials.